This article is written by Kathryn Haydon, founder of Sparkitivity. One of my favorite paintings is Georges Seurat’s A Sunday on La Grande Jatte – 1884, housed prominently in the Art Institute of Chicago. It lends itself to endless classroom applications across content areas: art, history, science, creative writing, French foreign language, and literature. You can even work math into this masterpiece, challenging your students to first estimate the number of dots on the roughly ten foot wide by seven foot tall canvas and then figure out how to prove their answers in 15 minutes or less. As a simple activity, early elementary students can count the number of people, boats, and animals (to save you time: there are 48 people). 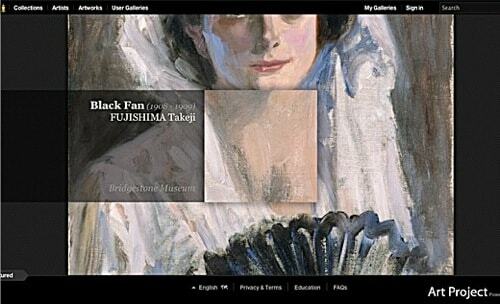 Google Art Project is an exciting way to bring rich works of art right into your classroom. It started with collections from 17 partner museums around the world and has grown to 151 museums. 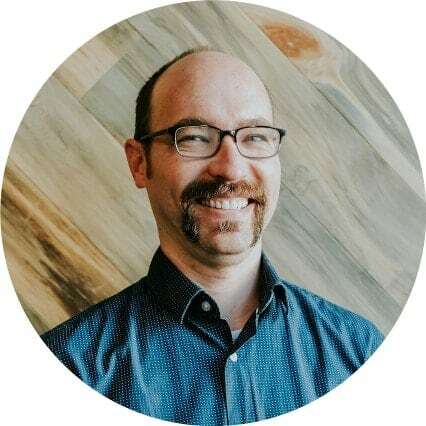 They photograph works of art in high resolution so the images yield exceptional detail and then post these images in galleries on the website. 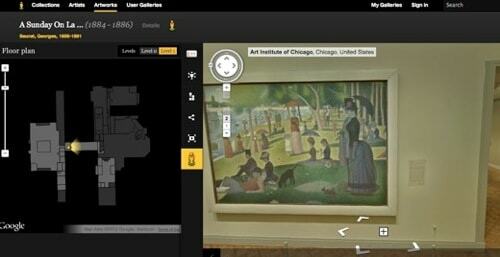 Just recently, they began adding the Art Institute of Chicago’s collections, including Sunday Afternoon. Go to the main website, googleartproject.com. 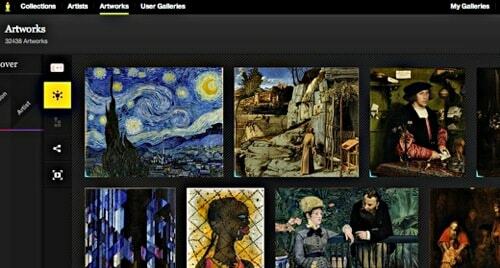 From there, try browsing by collections listed by museum, artist, artwork, peruse other user galleries, or enter a specific search term. 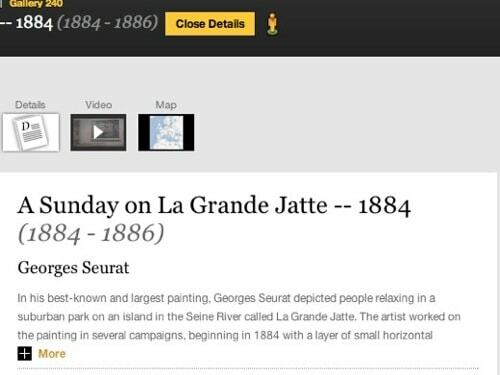 Once you select a painting here’s Sunday Afternoon, a host of options appears by clicking “details” next to the work’s title. There is historic information about the painting, a video to watch, and a map denoting the artist’s location. Even more exciting, if you click on the little orange and green man icon to the right of “details” you can walk into the gallery on a virtual tour like Google Street View, and explore the actual gallery in which the painting is housed. Though Google Art Project is an effective tool, I have been using a laminated poster for years for these activities. To get started and peak interest, I hang the poster on the wall or board, and share a few basic details, including the title. Georges Seurat began painting this in France in 1884. He didn’t finish until 1889. What do you observe about this painting? Come closer if you’d like to see better (or zoom in on the image). Yes! This painting was painted completely with dots. Does anyone know what that technique is called? Pointillism. Can you imagine painting this whole poster with dots? Well, do you realize that the actual painting was much, much bigger? Then, I mark out a space 10 feet wide by 7 feet tall. How long do you think this would take? The above is a simple jumping off point, and you can choose your own adventure from here. Is your goal to engage the class in an art lesson? Would you like to include more detail about the history surrounding the painting, impressionism, Seurat’s life, his process of painting? 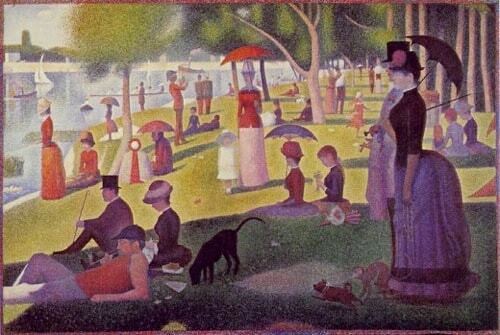 Seurat alluded to historic art such as Italian Renaissance frescoes, and Egyptian and Greek sculpture. The painting is set in Paris on the island named La Gran Jatte in the Seine River. There is interesting history about the painting that can be found in books or online. Seurat was calculated in his use of pointillism. Complimentary colors are key to the vibrancy that he achieved. You can go in-depth into color theory, color mixing, the color wheel, science of light, pigmentation, and much, much more. After the short introduction above, continue to engage the students in their observations about the scene. To their earlier point, why does the lady’s derriere look so large? Why are they all dressed up in the park? What are people doing? Then, the kicker: If you could jump into this painting as a person or object pictured, which would you choose? Start with a class example and choose a character in the painting. Then, ask the class to describe what that person is observing, doing, smelling, tasting, feeling. Write their responses line by line on the board, asking leading questions to get detailed and high-quality responses. When they have 7 to 10 lines, read it back to them and say, “This sounds like a free-verse poem.” Then have each member of the class choose a character, “jump into the painting,” pretend to be the character, and record the character’s observations as a free-verse poem. Can people please give me more space? I wish I had a different day off than everyone else. All this noise is making me cross. Monkeys hollering and acting crazy. so that I could admire nature’s beauty. Before class, cut 8.5” x 11” water color paper (or cardstock) into fourths, one per student. Buy a box of cotton swabs and hand out three per student. Ask each child to lightly sketch a nature scene (if desired give them magazine cut-outs or calendar pages for ideas, or go outside and do plein air sketches). Bring a color wheel and demonstrate the concept of complimentary colors. Let the students experiment with complimentary colors and paint (tempera works well), making dots with their cotton swabs. Once they understand how complimentary colors work, students “paint” their sketch using only dots with their cotton swabs. No strokes allowed! Depending on your goals, you can go in-depth in any of these content areas, or others of your creation. The point is, there now exists an accessible platform to bring art into your classroom, and there are so many ways of doing so that help you to meet your specific standards goals while broadening your students’ horizons, knowledge of culture, ability to critique and interpret a painting, creativity, and other academic subjects. Check out the “education” section of Google Art Project. There are some outstanding activities and challenges for you or your students. The DIY section allows you to create and post your own ideas. P.S. Though we have these incredible means of opening our students’ worlds to art these days, nothing beats seeing the actual work, in person. If you live in Chicago, see if you can arrange for a field trip. The Art Institute has [outstanding teacher resourcesttps://web.archive.org/web/20120518012951/http://www.artic.edu:80/aic/education/teachers.html), including a resource library that you can visit free of charge for access to lesson plans and other resources. Kathryn Haydon, founder of Sparkitivity, is a teacher, nationally-known writer and speaker, and a mentor to students of all ages. A life-long learner herself, she loves to find the most creative, innovative, hands-on ways to present math, writing, history, and science to kids. She has taught second grade, Spanish, creative writing, and journalism at Monica Ros, Topa Topa, and Valley Oak Charter schools in Ojai,CA, and creative writing at the Center for Gifted in Chicago. Katie is a published author on teaching, parenting, and early foreign language instruction, and her work was recently featured in Igniting Creativity in Gifted Learners, K-6, edited by Joan Franklin Smutny. A graduate of Northwestern University, Katie majored in Spanish and Latin American language, literature, and culture, and minored in economics. She serves on the Torrance Legacy Creative Writing Awards committee for the National Association for Gifted Children.